This is the first post in a themed series where I share stories and interesting details about plants. It's the month of love, and those of us who love plants probably feel the love back when we recognize their heart shapes. The three plants I'm sharing this month all have one thing in common: heart-shaped appendages. Prickly Pear Cactus (Opuntia) -- Love hurts. I have so many childhood memories of Opuntia: a section of our backyard was crawling with this mighty cactus, and on weekends, my grandma would take a large knife and chop down the Nopales (the flat pads) and cook them with eggs for breakfast. Despite the cactus' large intimidating spines that warn: do not touch!, my childhood eagerness to make the delicious nopales like my grandma, met with stinging hands... not from the spines but from tiny prickles called glochids -- they really itch! The prickles are so small, teensy, that not even tweezers can pluck them. Tip: if you ever find yourself with hands covered in glochids, apply elmer's glue or duct tape over the area and then peel away. It totally works! These cacti are native to the Americas, with many species ranging from Canada to South America. And like many other cacti, Opuntia have been subject to illegal poaching by smugglers and collectors (read more about that here). The Prickly Pear Cactus doesn't always have heart-shaped stems, but I think the ones that do are extra special. But admire them from a distance, or else you'll be at risk of getting stung. Dutchman's Pipevine (Aristolochia) -- Love stinks. Dutchman's Pipevine has heart-shaped leaves (in leaf morphology, this is called cordate), and flowers that look like pipes (when they're young) and female uterus' when they're mature. And so, that is how it got it's name, as well as it's ancient medicinal use themed around childbirth. The pipevine's flower is velvety and stinky (and huge, if it's the gigantum species as pictured here), with a special pollination mechanism that uses strong odor to attract a fly down it's narrow tube. Once inside, long hairs that line the tube prevent the fly from escaping (kind of like a ball past the flippers on a pinball machine). This flower, however, is not insectivorous. The trap is only temporary, and meant to ensure that the fly is covered in pollen. After some time, the hairs inside will wither, and the fly is released. If you're ever curious to visit this flower in person, and brave enough to stick your nose inside (the rotting meat odor this flower emits can't be that bad, right? ), find it growing along the very backside of the Fullerton Arboretum. Shepherd's Purse (Capsella bursa-pastoris) -- Love will eat you alive! Shepherd's Purse is a very common weed often found in old fields and roadsides and is easily identifiable by it's heart-shaped seedpods. The leaves, seeds, and oil of the plant are all edible (high in vitamin K!) and have been used as food for thousands of years. For medicinal use, shepherd's purse has been used to control internal and external bleeding (in WWII, Shepherd's Purse was used to staunch wound bleeding when other medicines were unavailable). An interesting Capsella adaptation: the seeds are myxospermous. This means that when the seeds are moistened in water, a sweet mucilage is produced. The mucilage attracts small insects and microorganisms and traps them. The germinating seedlings can then digest the insects and use the nutrients to grow! Does this make Shepherd's Purse an insectivore? Probably not, but scientists are still unsure as to why the plant has adapted this way. Reference: The Radicle Review and Molecular Expressions on Shepherd's Purse. Also known as the Sacred Fig or Bo Tree. 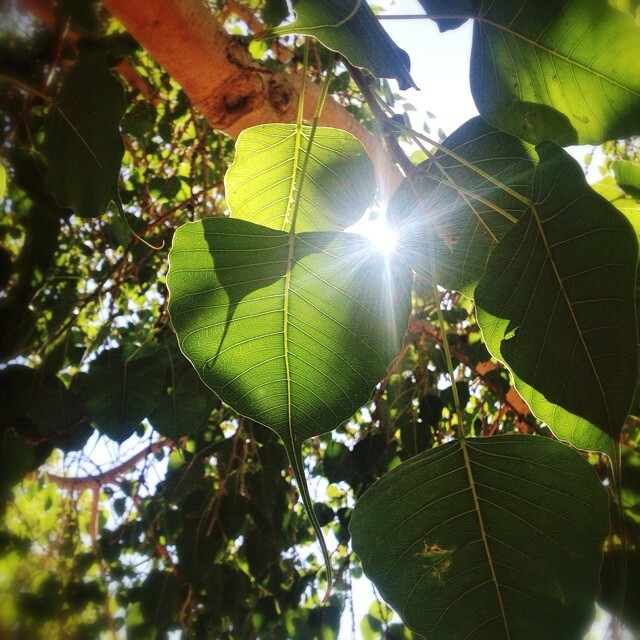 The Bodhi Tree has heart-shaped leaves with long tips that continue to sway and vibrate, even without a perceptible breeze. The spiritual belief is that the movement is caused by the devas (the plant angels) that live within the tree. The Bodhi Tree is so named for the Buddha, who is said to have attained enlightenment while meditating under this tree. The Sacred Fig is epiphytic, meaning it is non-parasitic but relies on other plants for support. Passing birds deposit the seeds onto the tops of other trees, where the seedlings receive enough sunlight to begin their growth. As the ficus grows, it's roots dangle down from the canopies, until eventually reaching the ground to form thick large (false) trunks that root into the soil. The Bodhi tree pictured here was blessed by the Dalai Lama and then planted at the Fullerton Arboretum. Reference: BBC Earth on fig trees and Missouri Botanical Garden on Ficus religiosa. Follow me on instagram @fairytale_slavery for more posts about plants!